Bacon’s history dates back thousands of years to 1500 B.C. 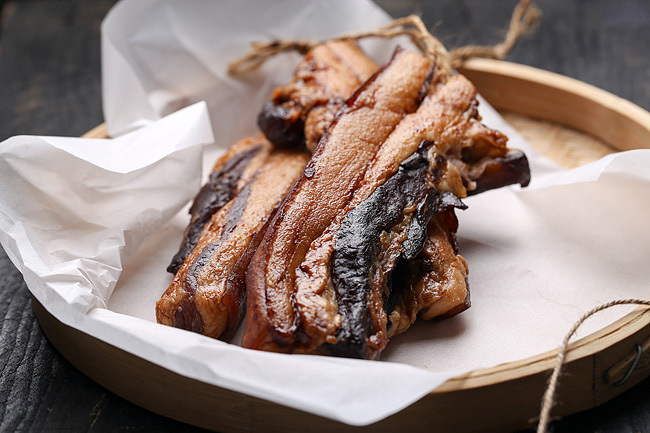 in which the Chinese were curing pork bellies with salt, creating an early form of bacon, although pigs were domesticated in China in 4900 B.C. and were also being raised in Europe by 1500 B.C. Speculation exists that the Romans and Greeks learned bacon production and curing through conquests in the Middle East. The Romans improved pig breeding and spread pork production throughout their empire. The word “bacon” derives originally from the Old High German “bacho”, meaning “buttock”, which in turn derived from the Proto-Germanic “backoz”, meaning “back”. By the 14th century, it found its way into Old French as “bacun”, meaning “back meat”. And by the 16th century, it found its way into Middle English as “bacoun”, which referred to all cured pork, not just the back meat. In the 12th century, a church in the English town of Dunmow promised a side of bacon to any married man who could swear before the congregation and God that he had not quarreled with his wife for a year and a day. A husband who could “bring home the bacon” was highly regarded by the community for his forbearance. 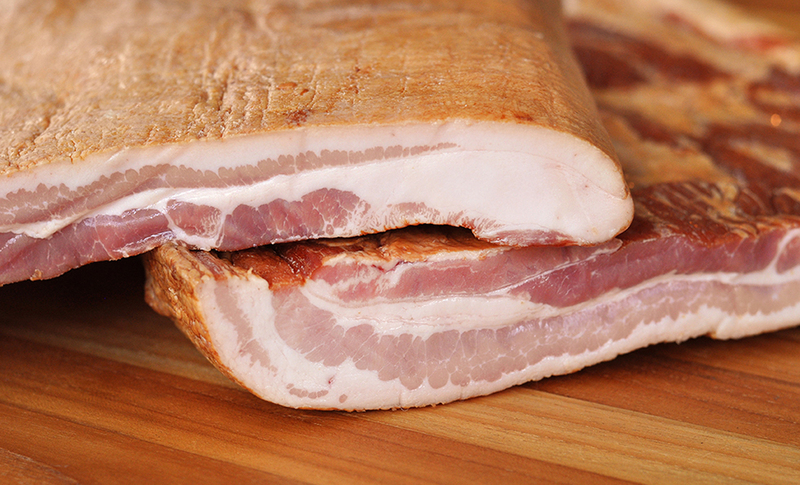 Cut from the belly of the pig, American-style bacon is cured in salt and then smoked. 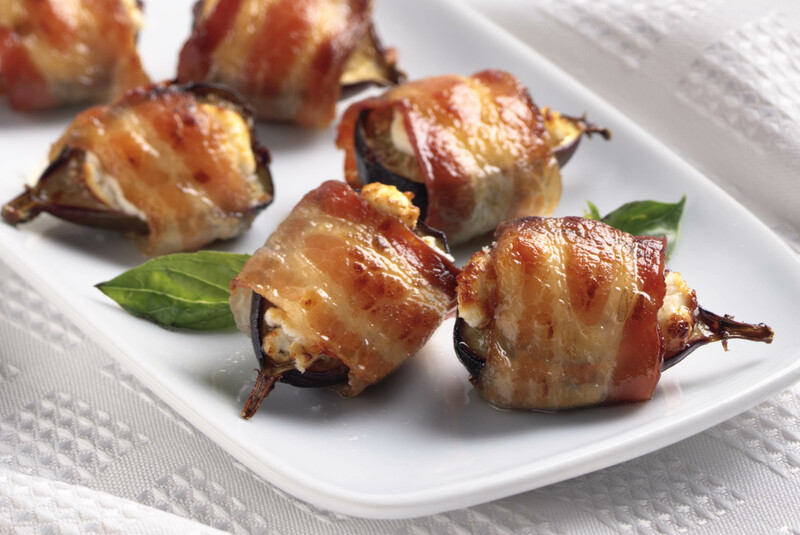 It has a streaky texture and ranges from very lean to very fatty depending on the selection and raising of the hog. 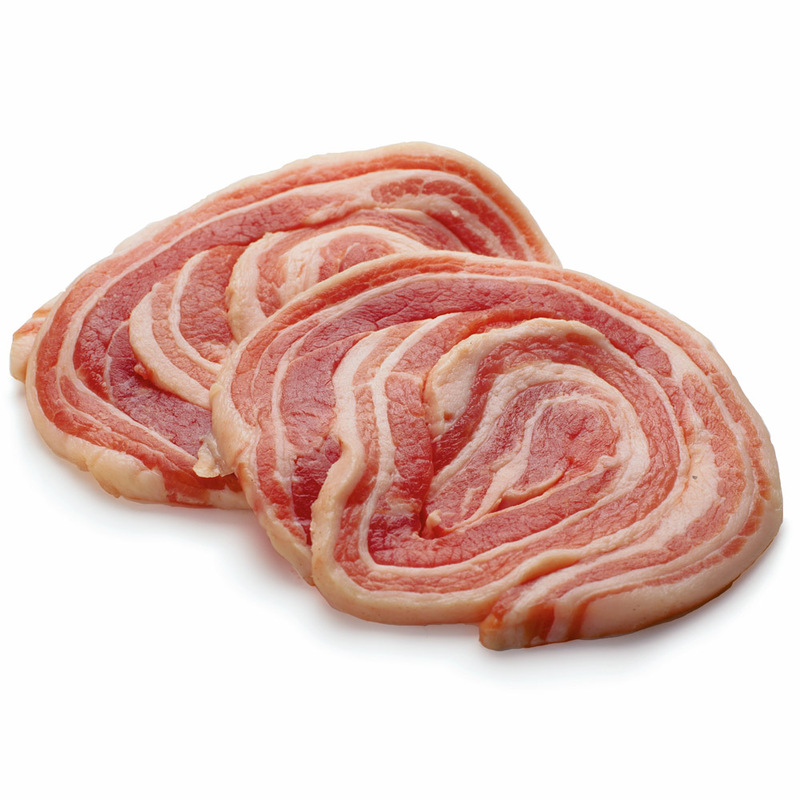 One of the most common types of American-style bacon is Virginia bacon. American-style bacon is cut in a variety of thicknesses: thin, regular, thick, and extra thick (sometimes referred to as bacon steak). Before the bacon is sliced the rind is taken off. A single piece of large bacon with the rind left on, slab bacon is sometimes roasted over corncobs for additional flavor. Cut from the pork loin from the back of the pig, Canadian bacon has fewer calories and less fat than American-style bacon. This popular pizza topping tastes a bit like ham and often has been smoked and cured. Italian-style bacon cured with peppercorns, salt, and cloves, pancetta is packaged in a roll similar to sausage and sold by the slice. A lean meat cut from the eye of the pork loin, Irish bacon is cured by smoking and is similar to boneless pork loin roast in appearance. It can be sliced thick or thin. 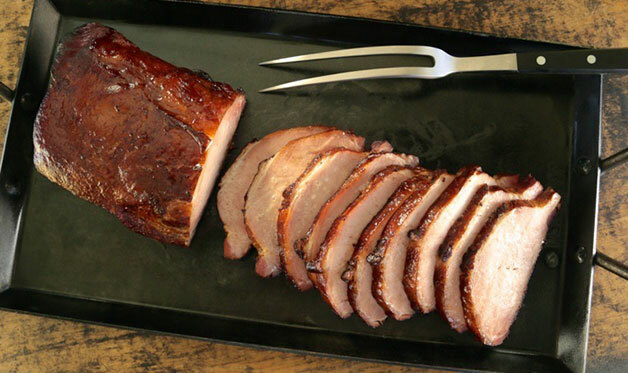 A Hungarian specialty, gypsy bacon is a slab of bacon roasted and seasoned with paprika. It is cut into thin slices and then served on rye bread. It is often sold in Hungarian or German markets. Prior to the introduction of refrigeration, the curing process was used to preserve all kinds of meat in Africa. Pork consumption in Africa has always been significant, in spite of widespread religious restrictions and cultural concerns. For many decades, tons of barrels of imported pork, mostly trotters, have landed at African ports, and pork is commonly used to add flavour to soups and stews. Consumption has increased substantially due to Africa’s increasing population, urbanisation and rising disposable incomes across the continent. There fore to assume that there was a Pork variation specifically from Africa lost in time due to Oral Traditional practices is not too far fetched.